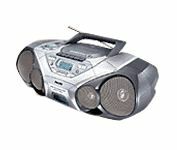 This CD Boombox combines compact disc digital audio player, stereo cassette deck, digital tuner and full-range speakers for excellent sound performance across the entire audio frequency spectrum. Incredible surround creates the illusion of the speakers being much further apart than they actually are, resulting in an enhanced, room-filled stereo effect. will NOT PLAY cf' NOW. PUT IN A DISK AND SAYS "CD OPEN", MESSAGE CAN ANYONE HELP?